As we drove home this afternoon, there were flocks upon flocks of geese, finally flying in Vee formation and headed south. Winter has been delayed here in the plains of Minnesota, most of the snow passing just to the south. This, we’re told by weathermen, is strangely unusual and some of them are even wondering if there will be a proper white Christmas in the forecast. My daughter, Noelle, has spent a fair amount of time outfitting herself for this year’s holiday event, envisioning her first sojourn to a wintry wonderland as the picture perfect postcard experience. And while we are aware that at some point before spring, all the cold “whiteness” may become stark and endless, we too would like to have our first Christmas in Minnesota to be a proper, traditional and awesome snow event. Just like Bing dreamed for us as we grew up in sunny Southern California. 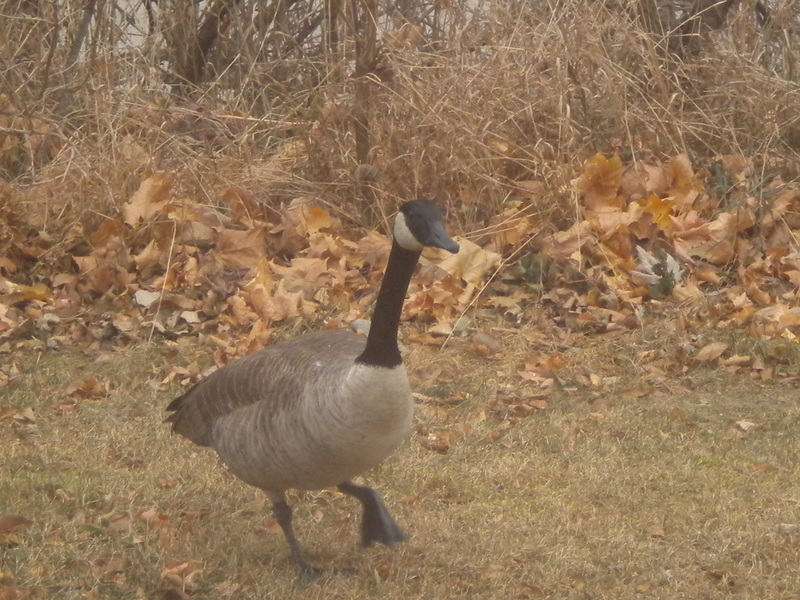 There was a sprinkling of lovely white flakes this afternoon and the bends in the Otter Tail are beginning to freeze in part, and that is most likely the reason for the delayed departure of our Canada Geese. And, yes, it does appear that they are finally lifting off and heading to climes more tropical. I haven’t checked today on the possible departure of my snow goose with the greater flocks, but I did come upon another mystery tale. 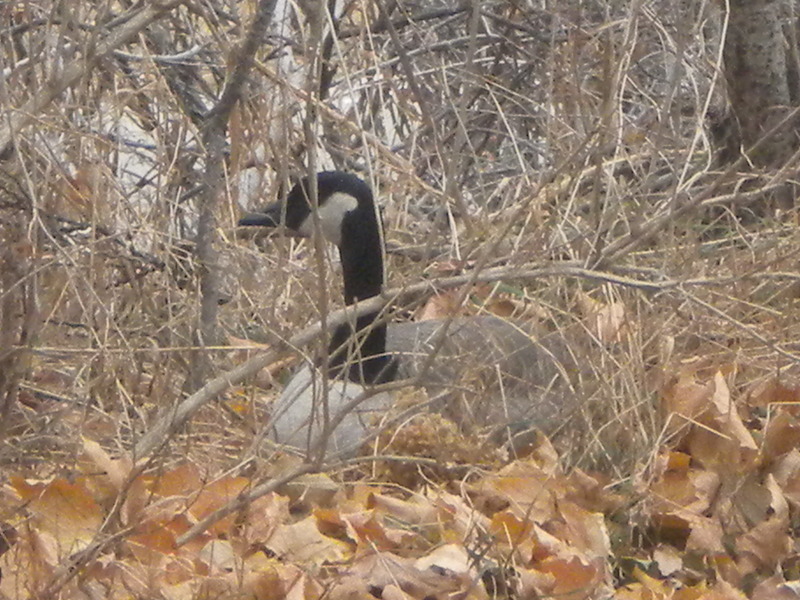 As we pulled into our drive this afternoon, I was shocked to see a lone Canada Goose huddled among the brown brush outside the kitchen window. I watched and waited and finally went outside and threw a handful of bread scraps to see if she responded. 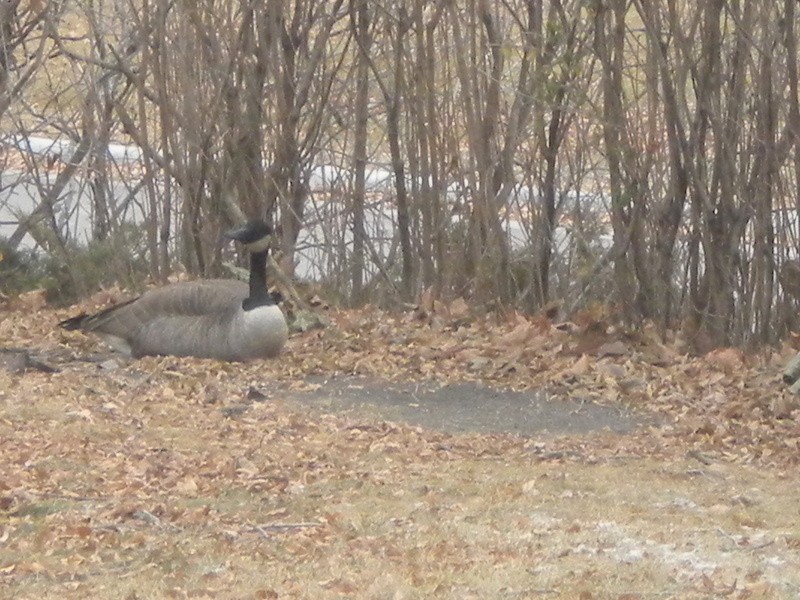 With the river just across the road and scavenger ground in between, the Canada Goose has never ventured onto our yard. Mr. and Mrs. Mallard last spring for a time, but never a goose of any species. I wanted to determine if the goose was injured, sick, or left behind. Call it my overactive imagination, but she seemed sad. She looked sad. 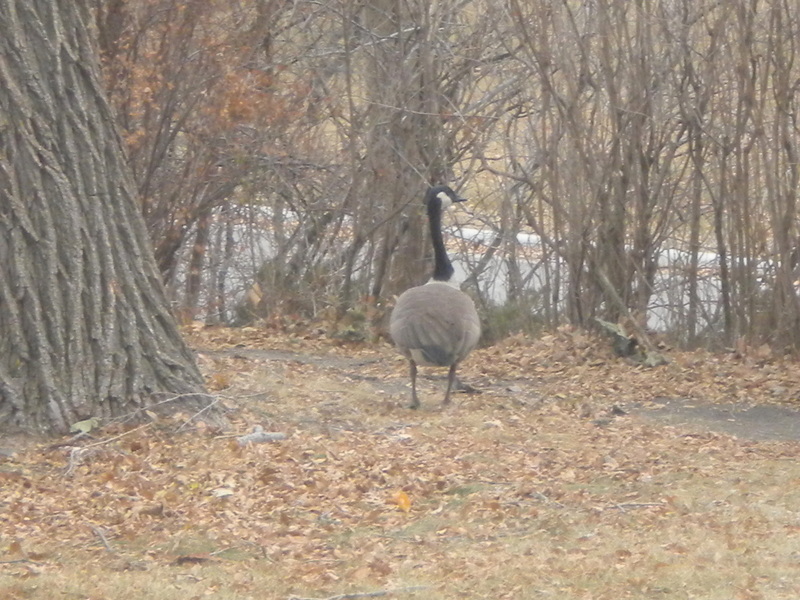 And when I threw the bread crumbs, she didn’t budge at first, didn’t even look in my direction. 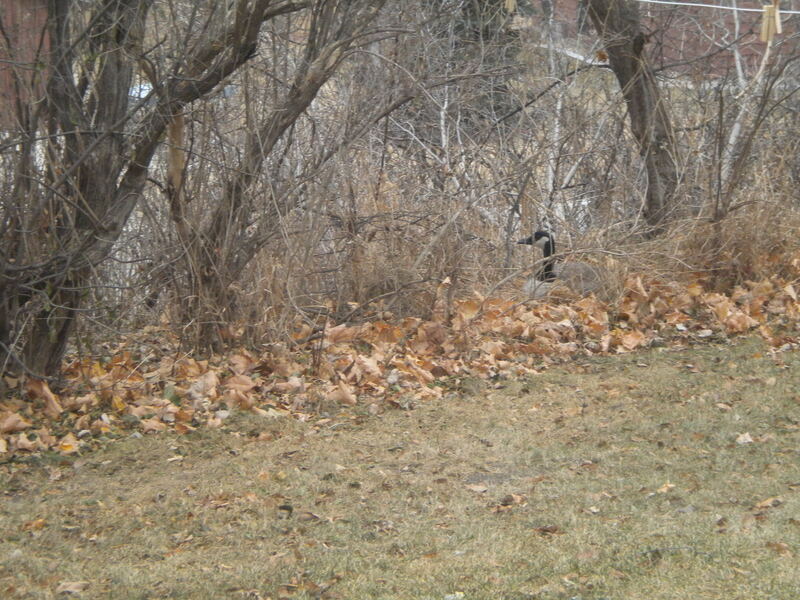 After I went indoors, however, she stood and waddled out of the brush and walked around the house to the front lilac hedge, looking all the while towards the river, and just sat down. Sad. Occasionally a small, tardy flock would course overhead, honking all the while on their migratory path, and she would look up. Very sad. Or so I imagined. 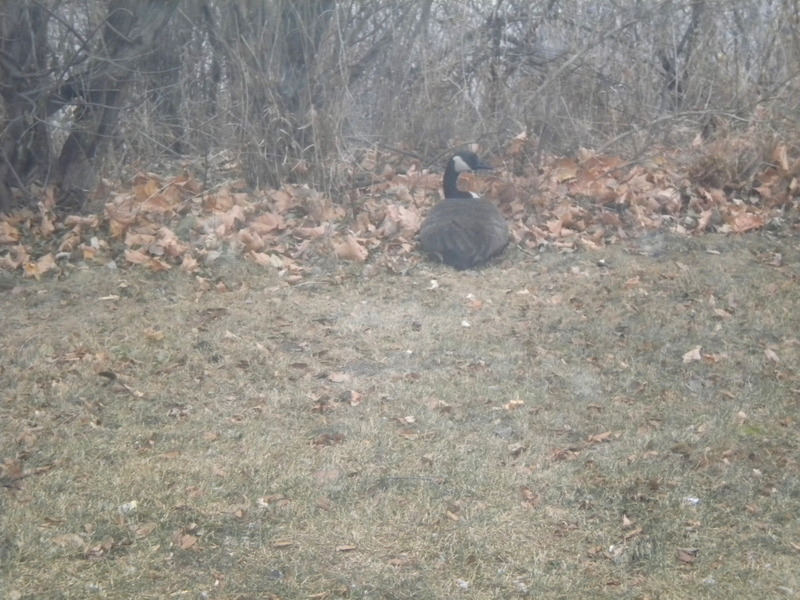 Eventually she returned to her spot outside the kitchen bushes and settled down. I kept watch until the dark and now I’m wondering. And a bit sad. This entry was posted in Birds, favorite things, minnesota life, Wild Life. Bookmark the permalink.